Shetland where I have lived for over 20 years lies on the 60 degrees north latitude in line with Greenland, Siberia and Alaska. The darkness of a northern winter has to be lived through in its entirety to appreciate the intensity that long hours and months of darkness has on all living things not least the human psyche. When the light returns in spring there is a collective sigh of relief as nature starts to relax and breathe again, which is quickly followed by an intense surge of creative energy as plants grow and birds couple up to reproduce in the short time of plenty they have. In Shetland there are many more birds than people and in daily life the various species of birds become familiar companions. Birds have always been special to me and at key moments in life such as births, deaths, weddings, funerals, illness and health birds have always been present. In these moments they become vessels of emotion that carry messages full of metaphor and meaning on the rich tapestry of life. The limitations of printmaking techniques force unclear ideas into sharp focus. As acid bites into metal an exciting mark is created that is difficult to erase. I learned to etch at the Royal Academy schools in London under the tutelage of Norman Ackroyd who is a master of aquatint and lover of wild places. The trio of Rembrandt, Goya and Bruegel are foundational cornerstones to me and have used etching in different ways. Rembrandt explores the nature of light with his heavily inked and sparsely wiped plates. Goya explores the nature of darkness in his sensitive use aquatint and Bruegel explores the human condition in all its manifestations, always set in a season or place that reflects his deep understanding of nature. Shetland is full of sacred sites that are redolent with atmosphere, presence, history and meaning. Some may be the remnants of ancient peoples who leave stones or patterns in the land, or they may be natural features such as rock formations, burns or lochs. It is in these sacred sites that I like to spend my time usually alone except for the birds. 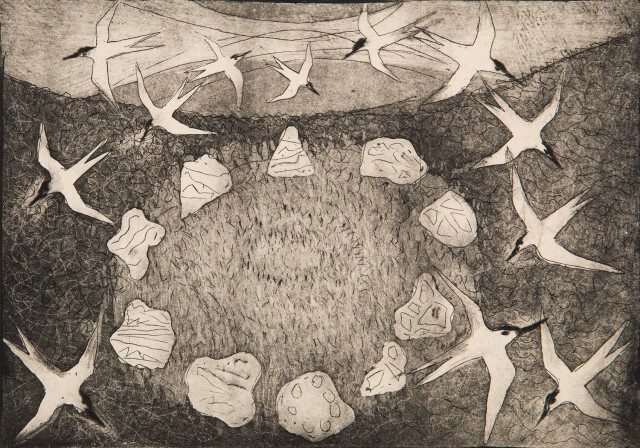 Images and narratives that are often bought to me by the birds form in my mind and it is these that I have translated into etchings. Birds cross international boundaries; true global travellers that see war and peace, beauty and decay, persecution and awe and feast and famine. If birds could tell us how to live what would they say? Sometimes the storm and chaos of the wider world press on me but, as I draw, I am reminded that here when the light returns all is well.